Few species stimulate the imagination more than owls. Flying nocturnal carnivores! Perhaps the most bizarre in appearance of the owls is the common barn owl. It is also the owl most likely to nest in a home habitat, given it's preference for nesting in the lofts, attics, and cupolas of buildings. I remember, many years ago, seeing my first barn owl up close. It was in a nest on a ledge high up in a hay mow of a deserted barn. The odd shape and large monkey face were no surprise since I had studied many pictures and sketches of this species. What I wasn't prepared for was the owl's reaction to my presence. With wings half spread, legs wide apart, and head bent down, it began slowly swaying from side to side. This bizarre response may sound harmless enough, but, it sure stopped me dead in my tracks. My next close-up encounter with this species happened many years later at approximately 3am while I was riding a motorcycle on a winding country road. What appeared to be a huge white bird flew into the beam of my headlight, it's wing tip grazing my face as it veered off to the side. Barn owls have profited from their close association with man's buildings, but, have not learned to cope with his automobiles. Many are killed by cars, probably due to their method of hunting on the wing by quartering fields at only a few feet above the ground. As development spreads into barn owl habitat, an ever increasing number of automobiles are traveling faster on improved roads. My third close encounter with a barn owl was soon after we moved to our present home. Owls had nested in one of the chimneys of our house and the fledglings were continually hissing and screaming in the sycamores in our front yard. One evening my wife, Diane, informed me that a large owl was in the house, flying from one upstairs bedroom to another. She has never let me forget that I didn't immediately believe her. But, I was soon convinced, when the owl, with 45" wingspan came flying toward me at eye level down our 42" wide hallway! We managed to gently throw a bed sheet over the owl and release it through an open window. We found that it had struck a screen door, knocking the screen out of it's frame, and falling into the house. In the seven years following this incident, the owls have raised young in our chimney each summer with virtually no contact between owl and human. Only a metal flue cover separates their nest from my son's bedroom, yet, these owls remain every bit as wild as the pair of red tailed hawks I often watch from my office window. The hawks will not let me approach within 100 yards, while the barn owls are literally sharing our house. They essentially ignore humans as long as they follow a predictable pattern of behavior, such as seldom venturing out into their hunting area in the dark and always remaining on the ground. I broke this second rule earlier this evening by climbing up on the peak of our roof with camera and flash to wait for the male owl to leave his roost. The female is incubating eggs in the south flue of the chimney while the male spends the day in his separate apartment in the north flue. During incubation, he does all the hunting and brings prey to the female who remains on the nest. At the proper time each evening, he climbs up to the top of the chimney and perches for several minutes, slowly peering around, and looking very much like I feel early in the morning. Then he silently lifts off and makes one circle of the yard, as if reconnoitering, and then disappears into the impending darkness. After I had waited an hour, perched on the peak of our tin roof with cable release in hand and eyes trained on the chimney, the male finally appeared. He stared at me for two or three minutes and then turned his back. After several more minutes, he spread his wings and lifted off of the chimney. As I tripped the camera and flash, he instantly whirled around and dropped back to the chimney, facing me. I don't know whether he returned to the chimney to protect the nest or just out of curiosity, but, eventually he decided I was of no consequence to his nightly business and flew again, making his usual circle and flying off into the darkness. When the young hatch, the female joins the male in hunting and both also take turns brooding. 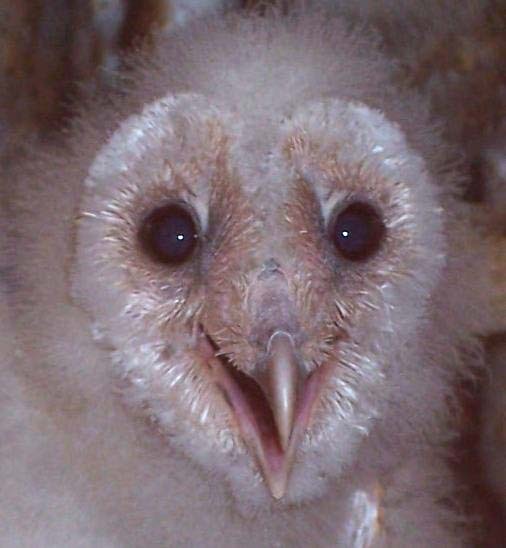 The baby owls soon begin to hiss when a parent brings food. The sound of five or six hissing owlets in the chimney is often disconcerting to visitors to our home. Eggs are laid at 2 to 3 day intervals and incubation begins when the first egg is laid, causing a difference in age of up to two weeks. If prey is scarce, the youngest owlets may be eaten by their larger brothers and sisters, although I have never seen evidence of this. While such asynchronous hatching doesn't work well for the youngest, it seems to work for the species. Even so, it is estimated that 3 out of 4 barn owls die in their first year. When the young fledge, there are no more quiet owls swooping about in secrecy. The young take up residence in the sycamore trees in our front yard, and, occasionally, on the upstairs porch railing. Various sounds that the owls make at this time have two things in common. Every utterance must be loud and weird. Their nocturnal screams on a hot summer night have often wakened me from a deep sleep. Owls add the element of surprise to the home habitat - the quickening heartbeat and the squirt of adrenalin. 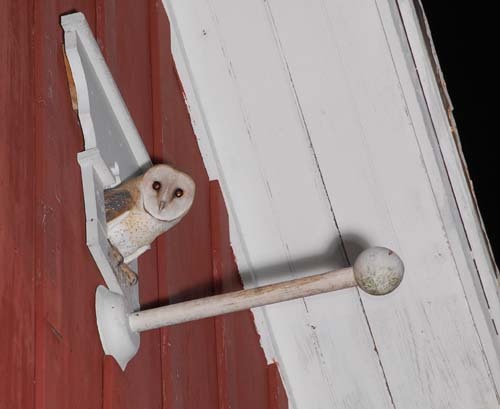 When I think of the appalling rate of development and loss of habitat in recent years in Frederick county, the primordial scream of the barn owl outside my window reminds me that there is still hope. Grown up pastures and abandoned fields are the barn owl's favorite habitat. In many parts of the country, where both development and modern row crop farming has left very little such habitat, the owl population is rapidly diminishing. 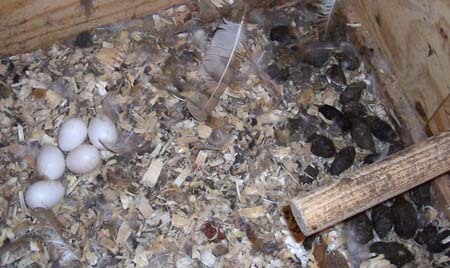 Nest sites are also lacking in many areas. Nest boxes placed in good owl habitat will likely be used. Where prey is abundant, overlapping home ranges are common, with the male defending not much more than the immediate nest area. Where prey is scarce, a much larger area is claimed. 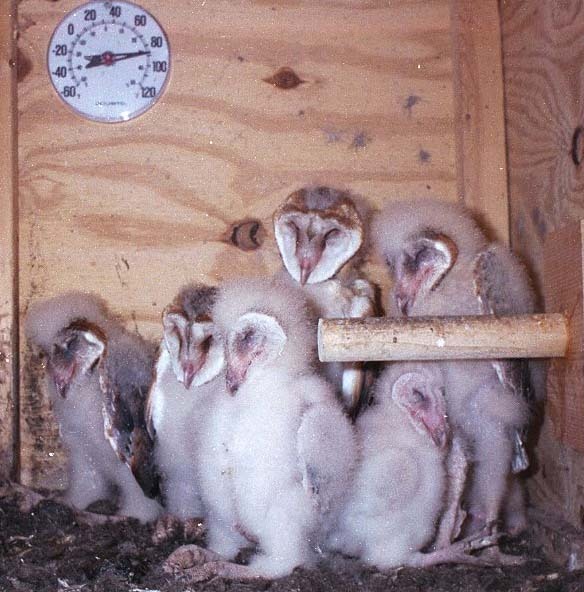 The minimum dimensions of a nest box for barn owls should be at least 18"x18"x18". Smaller dimensions are often quoted, as small as 10"wide. We recommend a 24" square box, 20" high, with 4" of sawdust covering the bottom. a 6" entrance hole should be placed well above the nesting material. The box should be mounted at least 12' high. Do not place the box near or especially facing a roadway, since barn owls are frequently struck by cars. What do owls eat? The answer seems to be whatever they can catch. Our owls dine most frequently on meadow voles, not because they prefer them to other species, but, because they are more common. Owls don't have time to pick and choose. Examining owl pellets in your home habitat can give you a good idea of the relative populations of prey available to the owl. A substantial prey population is an absolute necessity for supporting even a few predators. Don't expect the barn owl to wipe out your mouse or rat population. Long before that happens, he'll leave for greener pastures, or remain and perish. The number of rodents you grow in your home habitat determines the number of owls and hawks it will support. The meadow vole is the predator's hamburger. Sometimes it seems that half the creatures in our home habitat have a vole hanging out of their mouth. And, we see only a small fraction of what goes on. The fox, raccoon, weasel, mink, hawk, owl, and many species of snakes all share in this bountiful harvest. Voles need cover, so don't plan to grow your owl food in a 2" lawn or a neatly cultivated plot of row crops. If you rotate your garden, alternating with a cover crop, they will thrive in the undisturbed plot of rye or clover. One word of caution - in winter, voles will sometimes girdle young trees, so, protect any vulnerable trees with hardware cloth cylinders. &COPY; 1991 - 2013, American Artifacts and Richard Van Vleck, Taneytown, Maryland.